This year’s production was (arguably) easily the biggest performance we have undertaken to date. We started rehearsing back in September. We worked tirelessly with our Director Mr O’Connell choreographer Amanda Kearns, chorus mistress Helen Colbert and Ms Dunne. We stayed back after school two days a week, every Saturday and even dedicated two days of our midterm break to rehearse. It wasn’t all hard work though. 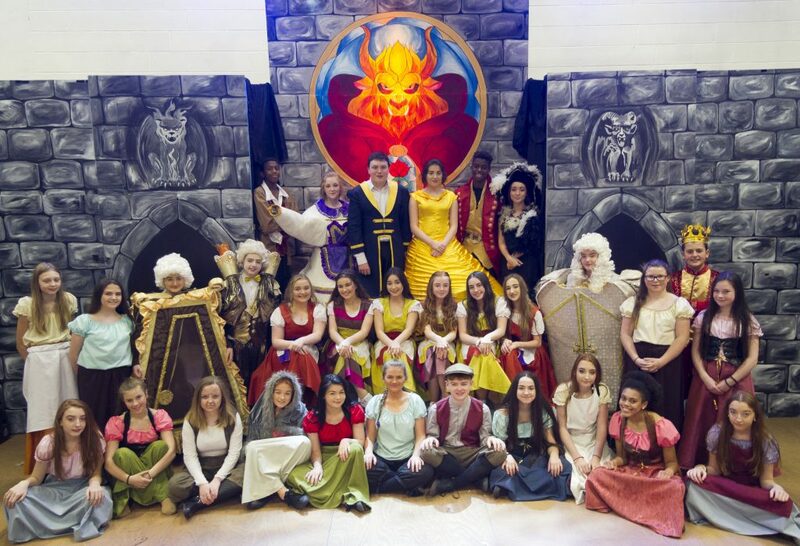 Late October we travelled to Thurles to see the Ursuline convent’s production Beauty and the Beast. With the cast of to 350 girls and an enviable set, they put on a spellbinding show. Seeing how good the show could be encouraged us to give it our all. Before we knew it December had crept up on us and for one week, dressed in eye catching costumes on a set designed by Mr O’Connor, we gave performances we could be extremely proud of. 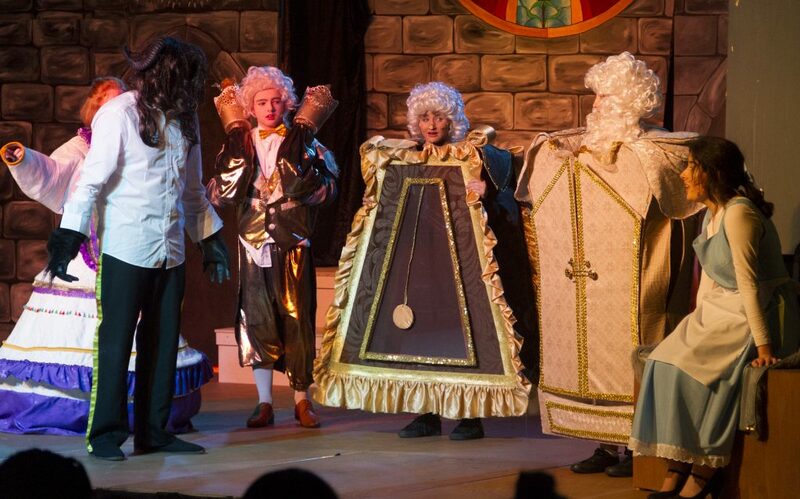 We had the pleasure of performing for over 250 local primary school students for our matinee show. We also performed to nearly 600 people for our evening shows. Our front line cast was undoubtedly one of the strongest we’ve had on stage led confidently by Saoirse O’Sullivan’s sweet performance as the leading lady Belle. She showcased her talent by taking on the role of the brave, bookish and complex character. She is a strong, intelligent, spirited, and independent young woman. Belle is the moral conscience of the story, elevated by her thoughts and deeds. The maturity and depth of her character allow her to see the true beauty and spirit within The Beast and to love him for it. Tommy captivated the audience with his sublime performance as Beast. His anger and frustration was expertly portrayed resulting in rousing applause from the audience for ‘If I can’t love her’ song which made his transformation at the end all the more rewarding. Sage Kaya commanded the stage as Gaston. The rude, brute of an antagonist drew laughter and applause for his on stage performance of ‘Me’ making Gaston both arrogant and insufferable while also being highly comical. The dynamic duo of Sophie Boyce and Adam Moynihan gave stellar performances as Cogsworth and Lumiere while O’Keefe Olenga transformed on stage every night into Gaston’s comical sidekick. His outstanding delivery of the song “Gaston” put his talents front and centre. Mrs. Potts was expertly handled by Sadbh O’Riordan. The maternal housekeeper was beautifully brought to life effortlessly by Sadbh and her stage presence and experience to date really shone through. Sarah Myles played the adorable optimism of Chip while Tilly Curtin brought a dark haunting macabre atmosphere to the show as the asylum owner Madame D’Arque. Paired with the leads was our talented young chorus (And stars of future productions) who opened the show up beautifully every time. Their warm start helped give off the right energy for the rest of the show. And so as the curtain falls on another production it all came together for a magical, enthralling performance. Thomond Community College shared a Mindfulness for 7-11 Year Olds – Next Online Course. The school has experienced the sudden death of our staff member Mr Michael Treacy. May he Rest In Peace. We are deeply saddened by Michael’s passing. We, as his school community, extend our deepest sympathies to his grieving family. Funeral arrangements will be communicated in due course. The school will be open tomorrow, Saturday from 12pm to 2pm for people to remember Michael. Tea/coffee and biscuits will be available. A book of Condolence will be available for people to sign.